Growing up on the Gulf coast of Texas and a stone's throw from the Louisiana border in the mid 50's to early 60's, the music I was most likely to hear was Country & Western and Cajun Zydeco. Once the British Invasion landed I was a quick convert to the Beatles and rock 'n roll and have now played a "Beatle" bass off and on for over 40 years. I'm not exactly sure when Celtic music worked its way into my musical tastes but with the exception of Rap and Metal, I've a wide ranging appreciation for music. A glimpse in my iTunes library would reveal everything from the acoustic stylings of America to the Texas-born rock of ZZTop. The Red Hot Chilli Pipers (not Peppers!) burst onto the music scene in 2002 (winning the BBC's "When Will I Be Famous" talent program) and, with their unique "bagrock" stylings (rock covers with a bagpipe lead), have skyrocketed to worldwide fame. By the time of my second visit to Scotland for Christmas/Hogmanay 2014 I was a solid fan. On that trip I saw the band live for the first time at The Corn Palace in Haddington. Thanks to an online contest and luck of the draw I won a "Meet & Greet" with the band and met fellow bassist Alan McGeoch. When the band announced a rare appearance in the southern USA, and in Baton Rouge, Louisiana no less, I was immediately online for tickets. After all, a 3-hour drive to Baton Rouge was quicker and cheaper than a flight to Scotland! This was a first ever gig in Louisiana for the band but the several hundred fans who gathered (even those who had mistakenly thought they had tickets for the Red Hot Chili Peppers) enjoyed a great show. A hallmark of this band, one seen not nearly often enough in my opinion, is their incredible willingness to meet and mingle with their fans. After each show - the two I've seen anyway - they all come out and meet and chat freely with fans and sign autographs. 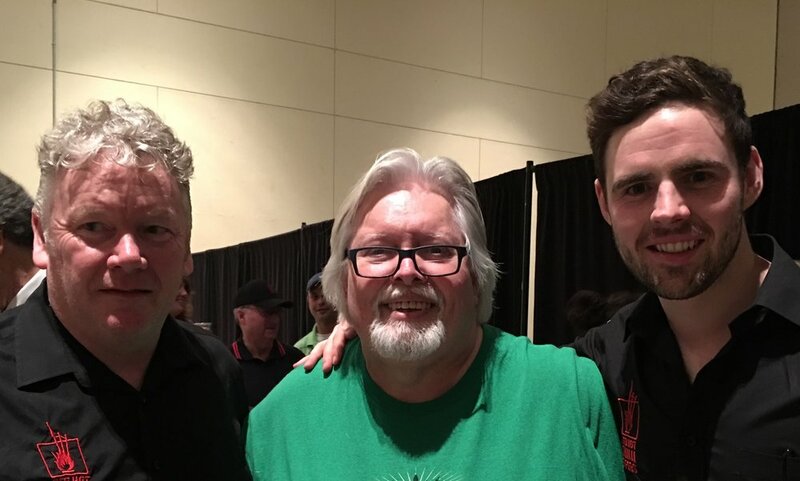 After the Baton Rouge show it was great to say hello again to my friend Alan McGeoch and to meet pipers Willie Armstrong (left) Dougie McCance (right). Both Alan and Dougie have also launched solo musical careers. Alan's CD "Modern Love Affair" is available at www.alanmcgeochmusic.com and Dougie's first release is expected out late this summer 2017. 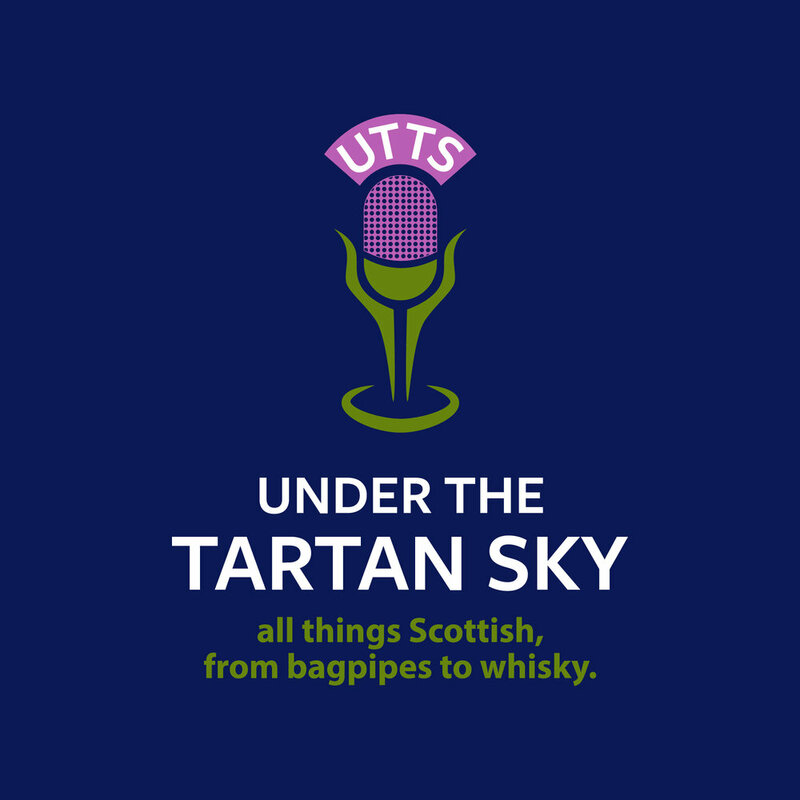 I'm excited to say that Dougie will be a guest on my podcast www.underthetartansky.scot shortly after the release date. Alan? The invitation is still open. Jed calls Texas home and while not a native, I give him credit for getting there as quickly as he could. He is a regular on the Scottish and Celtic festival circuit around the USA performing at more than 150 events annually. That's where I had the fortune of first meeting Jed, at the annual Tartan Festival of the Scottish Society of the Louisiana Highlands, held each April at the private "Scotland Farms" in Minden, Louisiana. 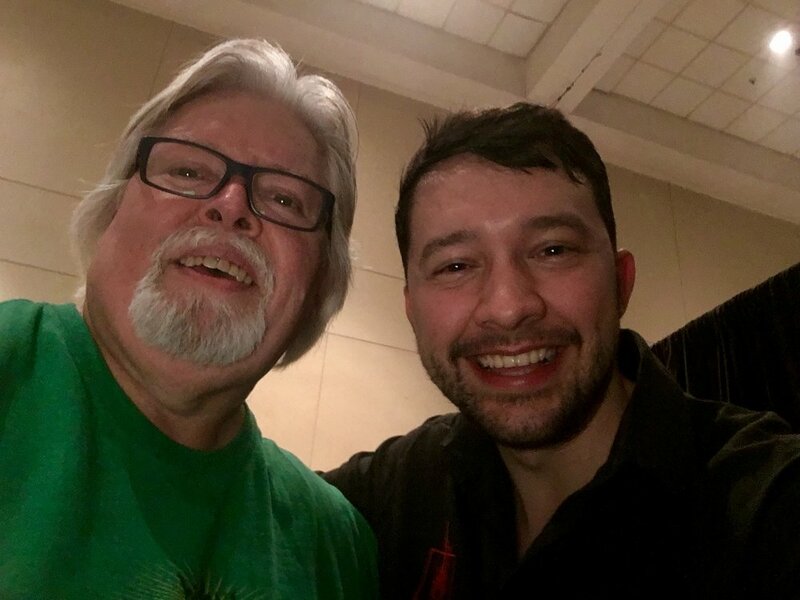 Jed is a regular at this annual event and this Spring, after almost a year of "fixin' to" as we say in Texas, I finally got to sit down and chat with Jed at length for my podcast. 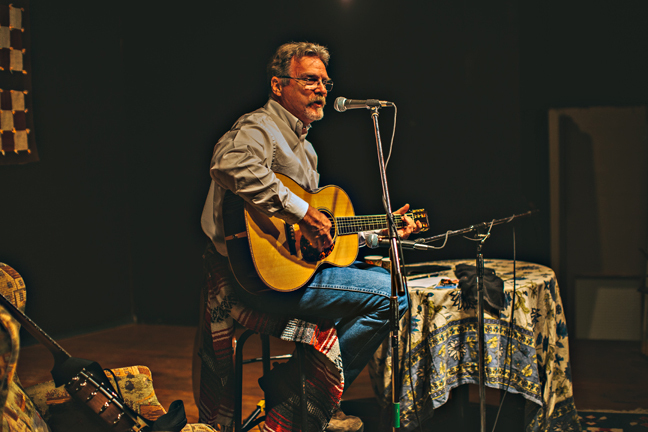 Beyond his talent as a singer, Marum is an accomplished songwriter and performer on the guitar, mandolin and banjo. He has contributed both original and classic songs to a half dozen Film and TV projects, most blending his American folk and Celtic styles and he has produced over a dozen albums. Much of the film work Jed has done revolves around the American Cvil War and his songs often are set in that time frame. Here he is performing one of his originals, "Fighting Irish Tigers." To see if Jed will be appearing near you in the future check out his website, www.jedmarum.com. American Public Television has introduced me to many wonderful British television dramas (my favorites) as well as given me (and millions of other viewers) the opportunity to enjoy major theatrical and musical productions that I might otherwise never have seen. Celtic Woman is one such act. Over the years the personnel has changed but not the formula or the success. Now in its 12th year as a production, 11 singers have been part of the group. Celtic Woman has six times been named Billboard's World Album Artist of the Year. When early this year PBS offered tickets with 'meet and greet' passes for the "Voices of Angels" tour I decided it was time to see this group live. I will admit to some early disappointment for when the art for the current tour came out I realized none of the four ladies were those I'd come so accustomed to seeing on the PBS specials. Any doubt I may have had was erased on the first note. Their voices were angelic and the performance simply magical. A huge video screen added to the dramatic effect as each song was accompanied by visuals that make you want to book the next passage to Ireland! 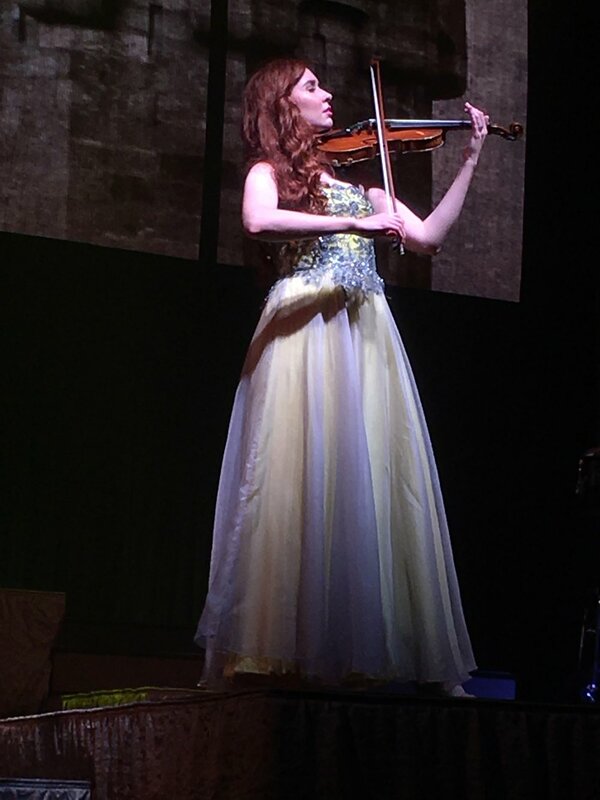 For me the most stunning moment of the night was delivered by the newest member of the group, Tara McNeill who only recently replaced fiddler Mairead Nesbitt. Her performance of "For the Love of a Princess", the love theme from "Braveheart." was musical heaven. 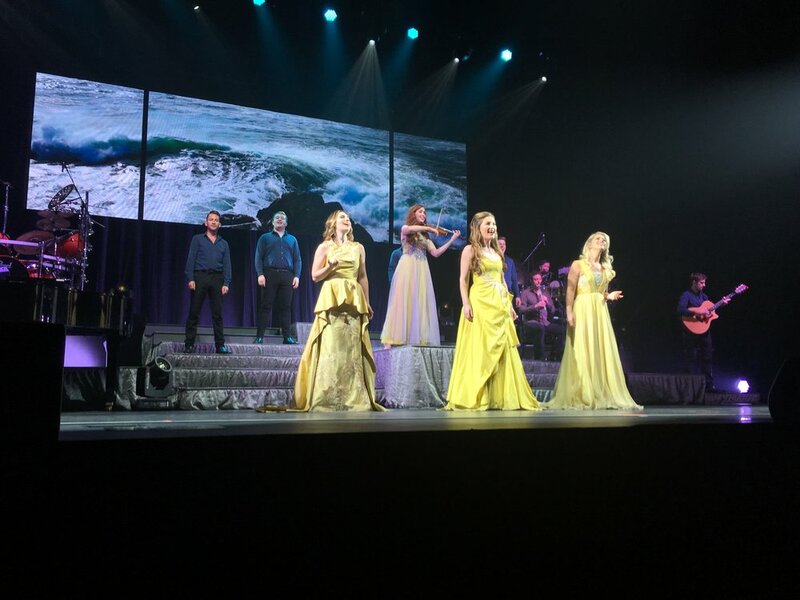 You can learn more about the current "Voices of Angels" tour on the website www.celticwoman.com. Here is the current Celtic Woman lineup with the classic, "Danny Boy." Performed live, I'll admit it brought a few tears to my eyes. So over the past few months, from March 17 in Baton Rouge, Louisiana, to May 16th in Longview, Texas, I've had the great thrill of seeing some wonderful live performances. If any of these artist are appearing near you in the future I highly recommend each and every one. 2017 has been a remarkable Spring of Celtic music on the bayou!